One of the most visual elements of the ITER construction site is the bioshield of the Tokamak complex, where the ITER machine will be located. As more concrete is being poured and works are advancing, this massive cylindrical wall is taking shape and is constantly rising. This shield, which will be 30 m high and its walls up to 3.5 m thick, will act as a safety barrier between the machine and the edifice. For civil engineers working on-site it is one of the trickiest elements of the main ITER buildings and they need to get it right from the start. Why? Think of the bioshield as the core of the building starting from the ground floor (level B2) all the way to the fourth floor (level L3), made of a mesh of concrete with steel bars, embedded plates and heavy anchoring equipment. 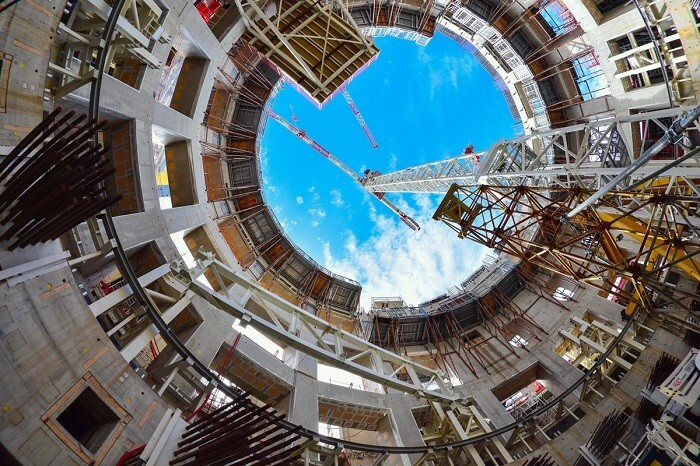 On the ground floor, a crown made of reinforced concrete, on which thick steel plates will be anchored, is going to offer the final layer of support to the ITER machine via the Croystat support bearings. 23 000 T of equipment will rest upon it almost like a jewel. To kick-off the construction of the concrete crown, whilst continuing with the erection of the remaining floors of the bioshield, a lid will be installed on its second floor to allow the workforces to carry out the works inside and above safely. In a nutshell, construction will unfold simultaneously in order to build the Tokamak support structure on the ground floor and raise the wall of the top floor. The assembly of the pre-fabricated lid, with an impressive 30 m diameter, has started and it expected to be in place by mid-August. A crane and other pieces of equipment will operate in the inner-space of the bioshield and works are expected to last for almost a year. When the works are completed the lid will be elevated to its final position, the fourth floor of the bioshield (level L3), through a lifting operation that will allow the finishing works to be carried out inside the entire cylindrical structure. In parallel, there has been more progress with the construction of the Tokamak complex, consisting of the Tritium, Tokamak and Diagnostics buildings. The first floor of this facility is completed and works are advancing at different pace for each of the buildings. The third floor of the Diagnostics building has been completed and the slab of the fourth floor is starting. The Tokamak building’s second floor slab has finished and the third floor slab has started while at the Tritium building, the second floor slab is ongoing.